Specifications: Measurements: 15.1 H x 6 W x 9.9 D Inches Net weight: 11.5 pounds Power: 150 watts, 110 volts, 60 hertz Flat grinding blade diameter: 50mm Coffee beans hopper capacity: 0.55 pounds Ground coffee doser capacity: 0.4 pounds Features: Stepped grinding regulation. Height-adjustable filterholder. Adjustable dose. Notes: Cleaning the parts on the Macap - before use, the bean hopper and covers should be cleaned with a mild, non-abrasive soap and rinsed. No retro kit available to upgrade older grinders. Please note as with all coffee grinders, it is very important to only change grind settings on Macap coffee grinders when the unit is powered 'on' and the burrs are in motion. If you do not do this, the burrs will 'gunk' up and require cleaning by you every time this occurs. Changing the grind settings when the burrs are not in motion will render the grinder to only produce very coarse grinds or no grinds at all. If this result occurs, this will be considered operator error for lack of following directions, and will not be classified as a defective grinder - meaning this is not covered under warranty. 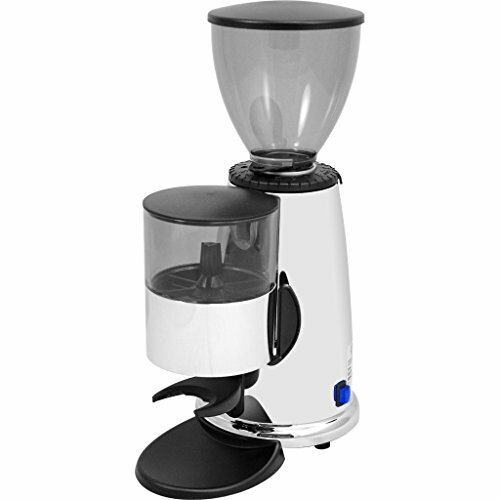 Macap grinders are considered commercial equipment for grinding coffee only and can not be returned once used. If you have any questions about this product by Espresso Outlet, contact us by completing and submitting the form below. If you are looking for a specif part number, please include it with your message.